2 free-range chicken breasts, skinned and cut into bite-sized pieces. This recipe is equally delicious with salmon and other firm-textured fish, or peeled king prawns – just adjust the cooking times. 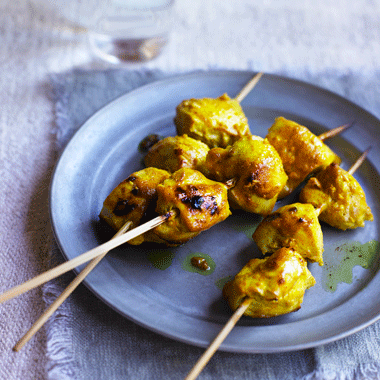 Combine the cold turmeric chicken skewers with some barley couscous tabbouleh (see page 132), and add freshly chopped cucumber and cooked beetroot along with a handful of flat-leaf parsley for a stunning light lunch. Make the marinade by mixing together the turmeric, chilli powder, lemon juice, garlic and yoghurt in a large mixing bowl. Coat the chicken in the marinade. Thread the chicken pieces onto the skewers and place on the hot baking tray pouring over some of the remaining marinade and discarding any excess. Place the tray under the grill and cook, turning the skewers every 2 minutes or so to ensure even cooking.